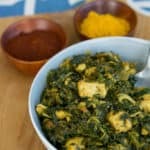 Chicken Saag Recipe | Simple and Low Carb! 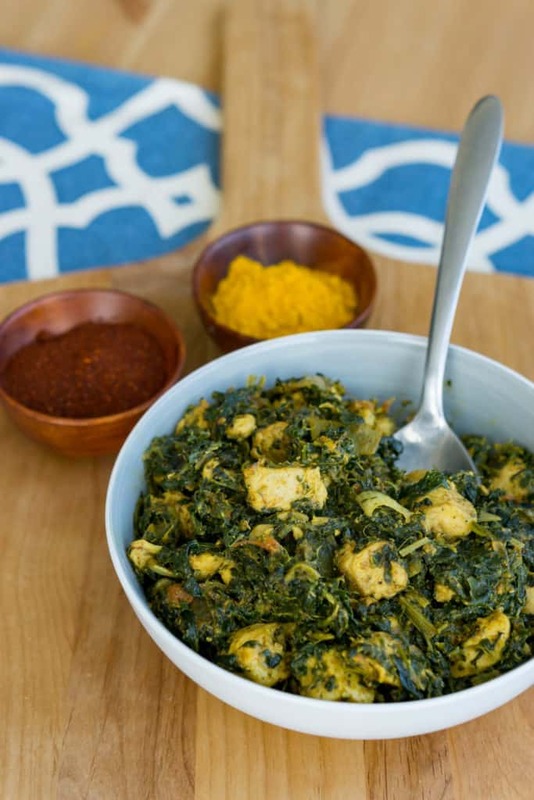 You wanted more Indian food, so we delivered with this Chicken Saag Recipe! If you like a combination of creamy, spicy and hearty, this recipe should be on tonight's dinner menu. Spinach has always been one of my least favorite vegetables, but when it comes to saag, (Indian spinach) I'm all about it. This can quickly be made any night of the week using frozen spinach and some chicken thighs, but my personal favorite touch would be to swap the chicken for some lamb! Go ahead and try it tonight. The problem with getting Indian take-out is you don't know when and if, (and they most likely are), adding sugar to the food. It's hard to truly be safe when eating out in general, but particularly with Indian food. Your best bet is to make it at home. There are several recipes online you can easily tweak, but why do that when we can tweak it for you. We use a combination of sour cream and heavy cream in this recipe for a creamier texture, but feel free to swap out the sour cream and use all heavy cream in this recipe! We've done our best to make it all possible, including coming up with our Naan recipe, so your only option isn't boring cauliflower rice. Personally, cauliflower makes me bloated and it just doesn't sit well in my stomach, so I prefer to use our Keto Naan when eating food or even for making sandwiches! What makes this recipe so simple is that the only spice you may not own is turmeric, and you can easily find that in any local grocery store. Once you own it, you'll be making Indian food every week. Not a fan of spinach, but love Indian food? Give our Keto Butter Chicken a try. It's all the rage and will turn you into an Indian food lover if you aren't already. If you don't have turmeric in your pantry, it's about time you start owning some. There are several dishes you make using just that one spice if you don't want to splurge on all the others, such as garham masala and coriander powder. I do my best to make recipes using as little outlandish spices as possible! 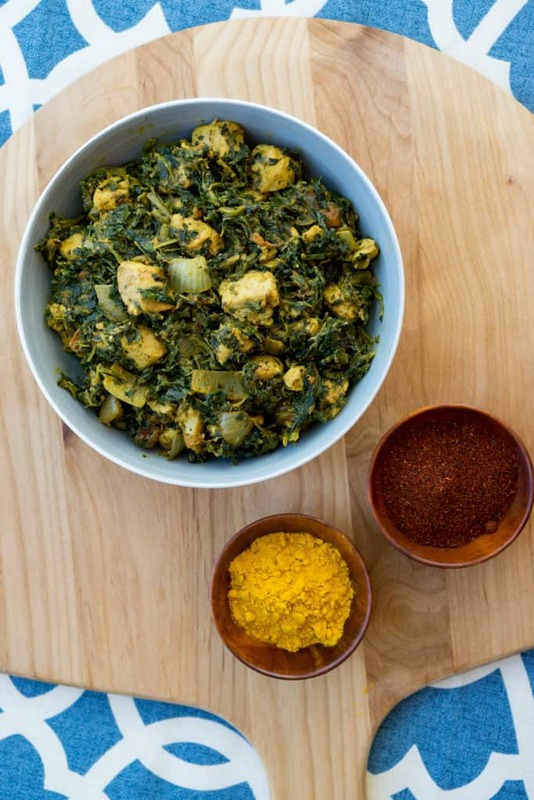 With Indian food being my favorite food, believe me when I say this Chicken Saag Recipe is not the last Indian recipe you'll see on our food blog. 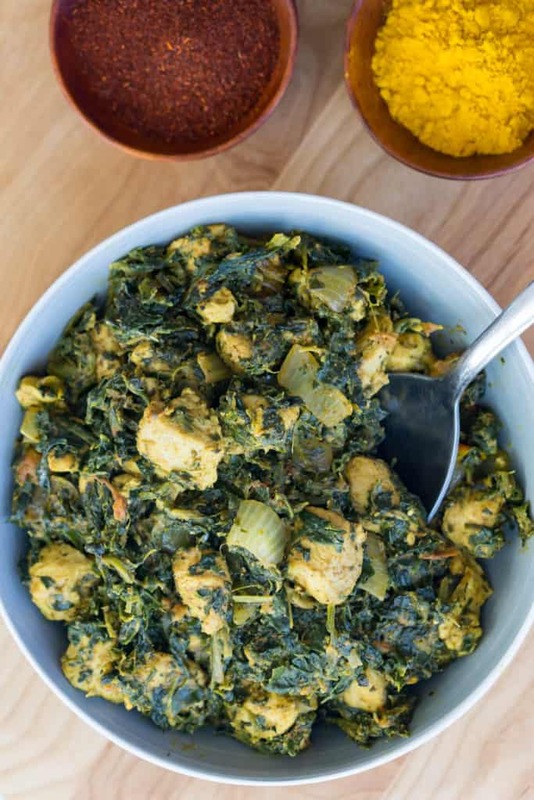 Recipe can be quickly added to MyFitnessPal - Search "KetoConnect - Low Carb Chicken Saag"
Heat a large skillet over medium-high heat and add 1 tbsp ghee. Add the chicken to the hot skillet, cook through, and remove and set aside. Add the second tbsp of ghee to the skillet and reduce the heat to medium-low. Add the dice onions and tomatoes and cook down for 3-5 minutes until the onions are tender and the tomatoes are soggy. Add the minced garlic, and fresh ginger. Stir with a wooden spoon until fragrant, about 1 minute. Add the cumin, turmeric, chili powder, allspice and salt. Combine and cook for 1-2 minutes. Turn the heat up to medium and add the chicken, and thawed and drained spinach. Combine through coating everything entirely in the spices. Cook through for 2-3 minutes, allowing any excess water to evaporate. Add the heavy whipping cream and sour cream and combine with the spoon until you get a smooth smooth cooked through consistency. At this point taste for spice level and feel free to add more slat, chili powder, cumin or ginger powder in place of freshly grated ginger. Cover with a lid and allow to cook for 3-5 minutes over medium heat. Serve immediately with our low carb naan or some cauliflower rice! Note: Indian dishes are all about taste testing and adjusting spice level to your liking! TIP: Lamb would be a great swap out for the chicken in this recipe!